Add an entry for Name="Title" and Value="welcome"
Open AppResources.es.resx and change "welcome" to "bienvenido"
Note: The day and month names are already in Spanish because they come from the operating system which knows to use the current language for dates. The Spanish-correct day/month/year formatting (vs. the United States default of month/day/year) is automatically provided by the DatePicker control. Open Resources.es.resx and change "CHOOSE DATE" to "ELIGE UNA FECHA", "cancel" to "cancelar", "done" to "listo", "Off" to "Desactivado", and "On" to "Activado"
Note: If you get the error Unable to copy file "obj\Debug\Microsoft.Phone.Controls.Toolkit.dll" to "..\Bin\Debug\Microsoft.Phone.Controls.Toolkit.dll". The process cannot access the file '..\Bin\Debug\Microsoft.Phone.Controls.Toolkit.dll' because it is being used by another process. when compiling, close all documents in Visual Studio via Window/Close All Documents, then restart Visual Studio itself. At the end of the day, translating an application isn't just a nice thing to do, it's good business! We operate in a global marketplace and that means localized products can have a big advantage over their single-language-only competitors. While good localization can't save a bad application from itself, it can make a good application stand out. So please think about localization in your next marketplace application - your customers will appreciate it! People sometimes ask why the Windows Phone Toolkit (or the Silverlight Toolkit, for that matter) isn't already localized to the same set of languages the host platform supports. While I personally think it should be, doing so would take time and money and those two things can be in rather short supply at times. :) While I hope to see Toolkit localization become official some day, the good news for now is that things have been implemented such that they're easily localizable. The default power settings for Windows are set up so a computer will go to sleep after 15 to 30 minutes of inactivity (i.e., no mouse or keyboard input). This is great because a computer that's not being used doesn't need to be running at full power. By letting an idle machine enter sleep mode, the user benefits from a significant reduction in electricity use, heat generation, component wear, etc.. And because sleep mode preserves the state of everything in memory, it's quick to enter, quick to exit, and doesn't affect the user's work-flow. All the same applications continue running, windows stay open and where they were, etc.. So sleep mode is a Good Thing and I'm a fan. However, sometimes a computer is busy even though someone isn't actively using the mouse and keyboard; common examples include playing a movie, burning a DVD, streaming music, etc.. In these cases, you don't want the machine to go to sleep because you're using it - even though you're not actually using it! So most media players and disc burners tell Windows not to go to sleep while they're running. In fact, there's a dedicated API for exactly this purpose: the SetThreadExecutionState Win32 Function. These people tend to put a shortcut to Insomnia in their Startup group (click Start Menu, All Programs, Startup) and set the "Minimize" flag to automatically run Insomnia as an icon in the notification area whenever they log in. Because they leave Insomnia running all the time, their computer stays awake and they're able to use it whenever they need to. I've always thought this is a cool scenario - and felt that maybe a lower-overhead version of Insomnia would be particularly compelling here. I wrote the original Insomnia using the .NET Framework - which meant it was super-easy to write and took practically no time or effort on my part. That's the way (uh-huh, uh-huh!) I like it, because the thing I have the least of is spare time and so anything that makes me more productive is full of win. And in my experience, .NET isn't just more productive, it's dramatically more productive. I thought it might be fun to re-implement Insomnia in native code (vs. managed code) since it was such a simple program. I've done exactly that - and the result is that Insomnia is now available in three versions: .NET, 32-bit native, and 64-bit native! Of course, while it was neat to do some Windows API coding for a change, the experience served to reinforce my belief in the fundamental productivity benefits of .NET and the power of the WPF/Silverlight layout system. About half the code in native Insomnia exists for the purpose of layout - which the .NET version accomplishes much more succinctly with XAML. The other half of the code handles basic framework-y stuff like creating a window, configuring it, etc. - more things WPF handles for you or makes quite convenient. And the last half of the code [ ;) ] deals with a variety of little things that are quite simple in the managed world, but require non-trivial effort in native code (ex: copying strings, setting up a complicated function call, etc.). The most common question I get about Insomnia is whether it also disables the screen saver - it does not. When Insomnia is running, the screen saver will continue to kick in and turn off the monitor on its usual schedule. The difference is that the computer itself will not be allowed to enter sleep mode. 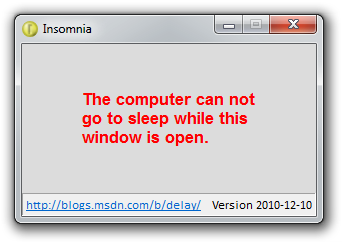 Once the Insomnia window is closed, the computer can sleep again and will do so on its usual schedule. 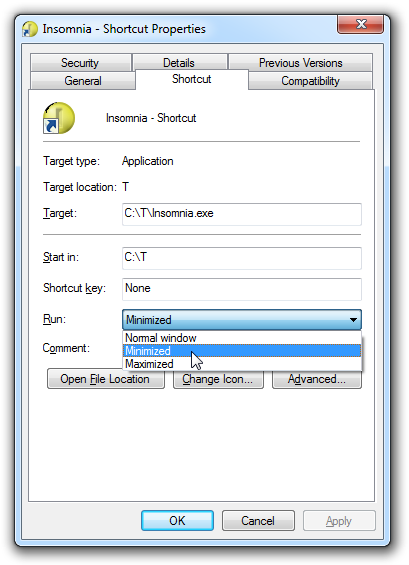 The second most common question I get is why the Insomnia window stays above other windows. As I explained in the introductory post, this is so Insomnia is always visible when running and people will be less likely to accidentally leave their computers sleep-less by forgetting they've started it. This seems like the right behavior for the original "temporarily prevent sleep mode" scenario; for the "always on" scenario, minimizing Insomnia to the notification area seems to work well for everyone I've talked to. The one thing I didn't port from the .NET version was the "/minimize" command-line switch. Originally intended to make it easy for users to start Insomnia minimized, commenter rbirkby reminded me that Windows shortcuts already made that easy enough. It didn't seem necessary to duplicate this somewhat unnecessary feature, so I've omitted it to keep the native version just a bit simpler. Not only do the native versions of Insomnia use less memory - they start faster, too! Because they have fewer dependencies, there's simply less stuff to load from disk - and because disk access is (relatively) slow, minimizing it can do a lot to improve startup speeds. Something that made life a little more pleasant for the native version was the SysLink common control - specifically its LM_GETIDEALSIZE message. This message is used to "Retrieve[s] the preferred height of a link for the control's current width." and it enabled me to approximate something kind of like WPF's measure/arrange-based layout system without having to write a bunch of code myself. So while I'd originally thought to use SysLink only for the hyperlink (duh! ), I ended up using it for the version text and message as well! As you'd expect, the Visual Studio solution/project for the new, native version of Insomnia uses the Visual Studio 2010 format. However, the solution/project for the original, managed version is still in the 2008 format I originally released it in (of course, opening it in VS 2010 automatically "upgrades" it). Aside: If my hashing efforts are new to you, more information can be found in my introduction to the ComputeFileHashes command-line tool and the subsequent release of ComputeFileHashes versions for the WPF and Silverlight platforms. When I first needed a managed implementation of the CRC-32 algorithm a while back, I ended up creating one from the reference implementation. Thanks to the strong similarities between C and C#, the algorithm itself required only minimal tweaks and the majority of my effort was packaging it up as a .NET HashAlgorithm. Because HashAlgorithm is the base class of all .NET hash functions, the CRC32 class ends up being trivial to drop into any .NET application that already deals with hashing. The Silverlight platform doesn't include an implementation of the MD5 algorithm like "desktop" .NET does, and I soon ended up creating an MD5 implementation from the reference code so I could support that algorithm on Silverlight (and now Windows Phone, too). Again, the C algorithm translated to C# fairly easily - though there's quite a lot more code for MD5 than CRC32 - and the HashAlgorithm base class makes it easy to reuse. Over the next few days, I made a couple of minor revisions to the CRC32 and MD5Managed classes, but have otherwise left things alone. I've used ComputeFileHashes successfully ever since, and things seemed to be in a pretty good state. And as long as I was already messing with the ComputeFileHashes code (which meant recompiling for each platform, re-packaging, uploading, etc. ), there were a few other things I decided to take care of at the same time. And it's just as well - in the process of doing so, I discovered (and fixed) a seemingly obscure bug in MD5Managed (which I suspect has never been hit in real life). Along the way, I added the complete suite of .NET HashAlgorithms to each tool so you'll automatically get the results of every supported algorithm when you hash a file! Note: Bookmark the link above for easy access to hashing anytime, anywhere, on any machine! CRC32 bug fix: HashCore was not adding the ibStart offset in its for loop. This is the issue Maurizio reported and would affect all scenarios where a non-0 value was passed for ibStart. MD5Managed bug fix: MD5Update was not adding the inputIndex offset in its call to MD5Transform. This is the obscure issue found by the new test framework - in certain fairly specific circumstances (mostly around odd offsets and buffer sizes), the incorrect offset could result in an invalid hash result. There's a comprehensive set of automated tests for CRC32 and MD5Managed. I'd done some basic testing of this code in the past, but hadn't covered the edge cases - and a few bugs slipped by because of that. So I wanted to create a thorough automated test suite this time around and do what I could to cover all the bases. The automated tests have a small library of different inputs and known-good hashes and process it in lots of different ways: all at once, in all different chunk sizes, with and without Initialize, etc.. If any of these techniques generates the wrong hash, the test suite reports the failure. The new tests are thorough enough to yield 100% code coverage on both the CRC32 and MD5Managed implementations. In addition to testing my CRC32 and MD5Managed classes, the automated tests also test the .NET MD5CryptoServiceProvider class - not because I expect to find errors in it, but so I can ensure both MD5 implementations behave the same in each scenario. Consequently (and as a result of the more thorough coverage) CRC32 and MD5Managed now behave the same as the .NET implementations for invalid scenarios, too - all the way to exception-level compatibility for misuse of the API! The only difference is for CryptographicUnexpectedOperationException which can't be constructed on Silverlight - its base class CryptographicException is thrown instead in cases where the hash value is retrieved before the process has been finalized. The Visual Studio solution and project files have been upgraded to the Visual Studio 2010 format. This makes developing ComputeFileHashes in Visual Studio 2010 easy and enables the use of its new and improved feature set. The CRC32/MD5Managed classes and the three ComputeFileHashes programs are now code analysis-clean for the complete Visual Studio 2010 rule set. Additional code analysis rules were introduced with VS 2010 and they reported some new violations in the code. These have all been fixed (or suppressed where appropriate). The namespace of the CRC32 and MD5Managed classes has been changed to "Delay". This change brings these classes inline with the rest of the sample code I publish and makes their generality a bit clearer. ComputeFileHashesCL remains a .NET 2.0 application for maximum versatility. By targeting .NET 2.0, ComputeFileHashesCL runs nearly everywhere .NET does. ComputeFileHashesWPF is now a .NET 4 application for compactness and ease of distribution. ComputeFileHashesWPF used to have a dependency on the WPFToolkit for its DataGrid control. Because that control is part of the .NET 4 Framework, the new ComputeFileHashesWPF no longer depends on any non-Framework assemblies and can be distributed as a single file. ComputeFileHashesSL is now a Silverlight 4 application to make use of new features in that platform. 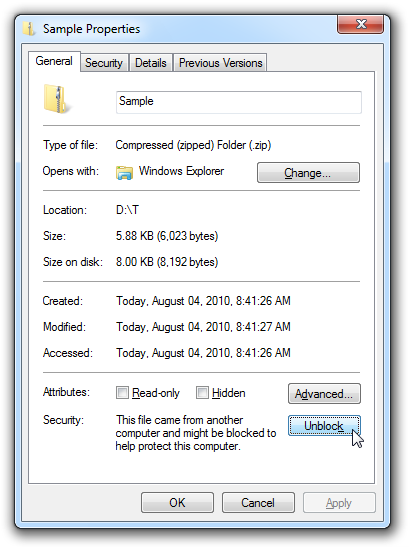 Most notably, ComputeFileHashesSL uses Silverlight's drag+drop support to enable the handy scenario of dragging a file directly from Windows Explorer and dropping it onto the ComputeFileHashesSL window to hash it (just like ComputeFileHashesWPF already supported). Additionally, I'm making use of my SetterValueBindingHelper class to use Bindings in a Setter and create the same ToolTip experience that ComputeFileHashesWPF already had: hovering over a hash failure shows the reason for the failure (typically because the file was locked by another process). Consequently, the "Details" column is no longer necessary in ComputeFileHashesSL and has been removed. The ClickOnce flavor of ComputeFileHashesWPF is no longer supported. With ComputeFileHashesSL's functionality getting closer to that of ComputeFileHashesWPF and the elimination of the WPFToolkit.dll dependency from ComputeFileHashesWPF, the need for a ClickOnce install seems minimal and has been removed. The version number has been updated to 2010-11-30.